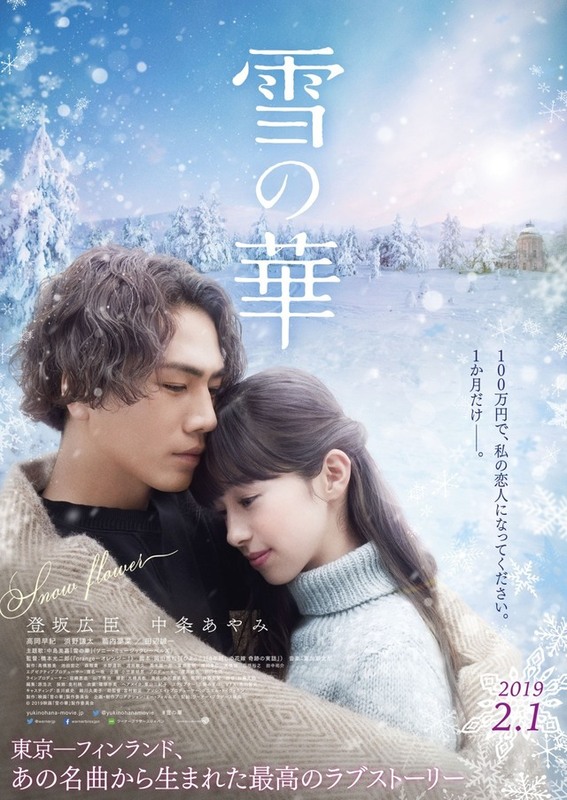 The movie "Yuki no Hana"
will be shown nationwide from 2/1 (Fri.)!! The official trailer has been unveiled!! "God, please let me fall in love once." It is a story of once in a lifetime love set in Tokyo and Finland. Miyuki (Ayami Nakajo) has given up on happiness because of illness she had since childhood. She is told she does not have much time left and her only goal is to see the aurora in Finland, ＜the land of promise＞. One day, Miyuki's purse is snatched. She does not utter a word and is dragged onto the ground. At that time, a young man named Yusuke (Hiroomi Tosaka) who aims at becoming a glass artist appears in front of her. "Say something! Shout!" His bluntness thaws her long-frozen heart. Miyuki gets to know that Yusuke's shop comes to a crisis and says to him: "I will give you one million yen. In exchange, you have to be my lover for a month." She makes a deal with him that they will be lovers in a limited period of time. Their precious encounter gives Miyuki the lifetime's worth of courage and brings color to Yusuke's life. It is a story of once in a lifetime love set in Tokyo and Finland, ＜the land of promise＞. Yusuke Watabiki is a young man who is working while dreaming of becoming a glass artist. He lost his parents and raised his younger brother and sister on his own. He is blunt in speech, but honest and gentle. He encounters Miyuki by helping her when her purse is snatched, and something inside him changes. The filming has ended smoothly and the whole picture of the movie has been revealed. My expectation rises and at the same time I feel confident. I myself carry out activities as an artist, so I feel honored to be involved in a movie based on Mika Nakashima's song "Yuki no Hana". As an artist, I tried to understand the meaning of the song and convey the world of the work and the role of Yusuke in my own way. In order to create a movie that will be widely loved, I worked on the movie together with reliable staff and the cast members including Nakajo. Please look forward to its release! She is weak from a young age and gives up on her life after she is told she does not have much time to live. But after meeting Yusuke and spending time with him as limited-time lovers, she begins to feel the happiness of finding love. Her dream is to see the red aurora which brings "miracles" in Finland where her parents met for the first time. She met Miyuki's father during a trip to Finland and fell in love with him. After her husband's death, she struggles to raise Miyuki who has a poor health. Encouraged by Miyuki's words "You have to think more of yourself", Reiko realizes her long-cherished dream of becoming a designer and now she works in Kyoto. While worrying about Miyuki's physical strength, he supports her dream to see Aurora in Finland. After getting to know Miyuki's limited-time love story with Yusuke, he supports her decision of trying to change herself. He is the owner of the cafe where Yusuke works at. He has a friendly personality and is good at taking care of people and loved by Yusuke, Yusuke's siblings. He also makes leather products. His products and Yusuke's glass works are displayed and sold at his cafe. The berry pancakes made by him is the signature dish of the cafe. Movie cards will be sold from 11/23 (Fri. & Holiday)!! on the official website of movie cards"
10 purchasers will receive posters. 3 purchasers will receive Christmas version postcards with a signature. *The postcards feature a still from the movie. 10 customers in 5 groups will be invited to the Japan Premiere.